If you’re an artistic person with a knack for designing or drawing, why not turn your skill into a creative career? The field of graphic design may be right up your alley. Graphic design lets you turn your art into an in-demand skill as you create digital designs for marketing, publishing, advertising, web design, and a host of other career opportunities. And today, with the need for digital design, graphic design jobs abound. To be eligible for today’s best graphic design gigs, including as a web developer or a software designer, you’ll need both artistic skill and a degree. The best opportunities are available to professionals who possess associate or bachelor’s degrees in graphic design – but, if you’re worried about spending time and money to earn your degree, there’s good news. Anyone can earn a graphic design degree online, and you can often do so in less time and for less money. Here are just a few reasons why so many people are opting to get a graphic design degree online. It’s easy to assume the only way to pursue a degree in graphic design is by attending a traditional, brick-and-mortar, four-year college or university. Such schools do have a lot to offer, but there’s no requirement that says that you must attend classes in person to obtain the training you need for your degree. So, more and more people are opting to pursue their graphic design degrees online — and it’s both cheaper and more flexible than traditional colleges. Tuition tends to be significantly cheaper for online degree programs because of the low overhead. There’s no need to provide classroom space; students don’t need to commute or live on campus; and you may even be able to use online textbooks. As a result, online colleges offer tuition that’s much cheaper than a traditional college. U.S. News¹ reports that some schools, like the Georgia Institute of Technology, offers online degrees for approximately $6,000 – a price tag that’s $35,000 less than on-campus tuition. Others, like the University of the People, even offer some tuition-free degree options. Additionally, you can complete your degree on your own time and schedule. Most online degree programs are conducted asynchronously, which means students complete the required work at their own pace and can view lessons and lectures any time. This is great for busy working adults or for those who have many responsibilities. Like many creative types, you may recoil at the idea of having to sit in a classroom for hours on end every day. 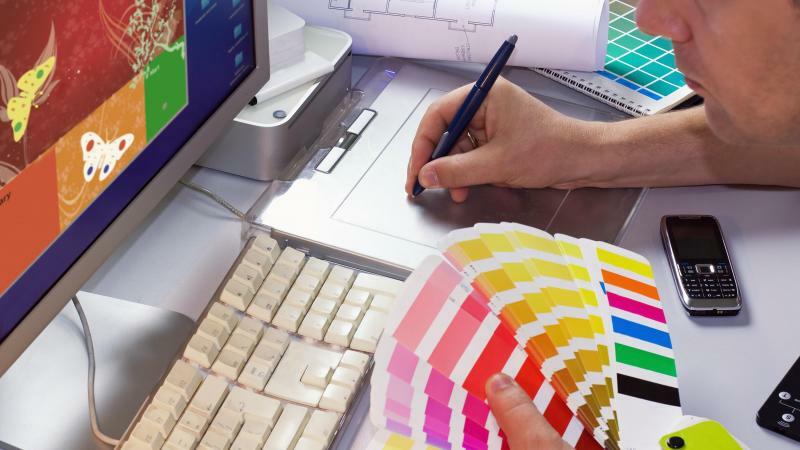 By pursuing a graphic design degree online, however, you’ll be able to choose where you study. You can get your coursework done at home, of course, but you can also explore local libraries, coffee shops, or any other place that suits you. If you work a full-time job, you could even use your breaks for studying sessions. Since you won’t be tied down to in-person classes on a set schedule, you can take your studying wherever you need to — what could be better than that? Graphic Designer: Graphic designers develop graphics and layouts for everything from logos to websites to magazines and advertisements. According to the U.S. Bureau of Labor Statistics², or BLS, graphic designers earned a median salary of $48,700 in 2017. Software Developer: These professionals design, develop, and modify software applications according to user needs and system requirements. In 2017, the BLS³ reports software developers earned a median salary of $103,560, or around $49.79 per hour. Web Designer: With a degree in graphic design, you will be eligible to pursue web designer jobs. These professionals use programming languages to design, build and maintain websites. The median salary for web designers in 2017 according to the BLS⁴ was $67,990, or $32.69 per hour. Marketing Specialist: Marketing specialists collect and analyze information about consumers’ needs, preferences and habits, and they analyze competitors as well to develop marketing campaigns. In 2017, they earned a median salary of $63,230, or $30.40 per hour, according to the BLS⁵. Art Director: These professionals are responsible for the overall visual style and images in magazines, TV shows, movies, newspapers, product packaging, and more. In 2017, they earned a median salary of $92,500, or $44.47 per hour according to the BLS⁶. As you can see from the above careers, graphic design students will enjoy excellent job security for the foreseeable future. That’s the case, at least, for those willing to work in the digital realm as web developers, software designers, and the like. Careers in those fields are growing at a fast rate. While many with graphic design degrees work for employers like web design companies and marketing firms, a significant percent work as freelancers. Therefore, you don’t necessarily have to find a job upon earning your degree; you could pursue a career as a self-employed graphic designer instead and be your own boss. The degree also opens up the door to taking side gigs to earn a little extra money while holding down a regular job. Since you aren’t bound by geography with online graphic design degree programs, you can take your pick from hundreds of options around the country. A great first step is to identify accredited programs that suit your needs. The National Association of Schools of Art and Design⁷ has accredited more than 350 graphic design degree programs, including many online programs, so they are a great resource to turn to for help. Make sure to also do plenty of your own research to pinpoint a program that helps you meet your objectives quickly and affordably. If you’re interested in earning a graphic design degree, start a search today.